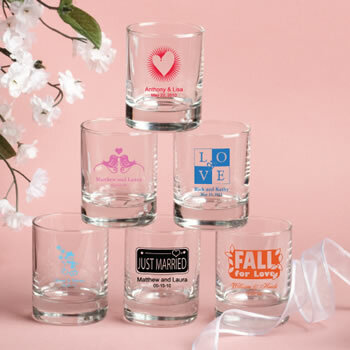 Whether you choose to use them as shot glasses or as decorative votive candle holders, these wedding favors are guaranteed to shine! From Fashioncraft's Silkscreened Glassware Collection, each favor measures 2.5" tall x 2" in diameter, with a 3.5" ounce capacity, in a classic shot glass/votive holder shape with a thick glass base. Made in the USA, each is made of clear glass and they're perfectly fitted to be silk screened with amazing accuracy directly on the glass in a wide variety of all occasion themes, designs, colors and titles that match your theme and your personal preferences. 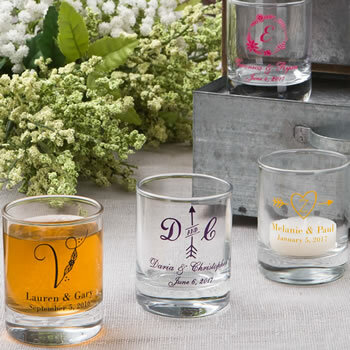 A versatile and attractive choice, these personalized cordial/shot glass favors come bulk packed. Please allow two weeks for silk screening and processing as well as transit time for shipping to your location. Everything was fabulous..arrived unbroken and on time. I'm a customer for life. Thank you for everything it was perfect. I loved my party favors so much. The service was fast and my package arrived a few days ahead of schedule. My only complaint is the size of the font. I did not do a good job when choosing the fonts- I did preview it however some of the words in my design were small. The finished product was lovely and I will definitely order for the company again. I ordered the shot glasses for my daughter's sweet sixteen and the items were shipped within 10 days. The items were wrapped with extra care. Thank you for the beautiful glasses. The glasses look great. I got exactly what I expected. Shipping was quick. The glasses were packaged really well. Didn’t lose a single glass during shipping. Would recommend this for anyone wanting a quality favor for their wedding or party. So somehow I made it to less than a month until my wedding date and forgot to order my favors. I was pretty certain that there was no way I was going to be able to order anything worth any kind of quality in time, and I am happy to say that I was proven wrong. NicePriceFavors was able to design and deliver my shot glasses in record time and the pricing was very competitive for which I am still very grateful. 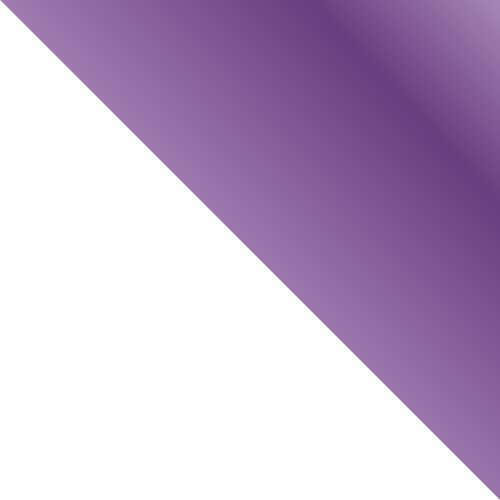 I only wish there were a way to pay a lesser fee for designs if you're ordering more than one item or more than one design on the same item, I'd have ordered more items if so. I ordered the glasses for my parent's anniversary party and they came out terrific! I received them super quickly and none of them broke during shipping! A total bargain for what I received! I highly recommend them! These were a great wedding favors since our families both drink. We got our glasses in a reasonable time, and none came broken. So that was great. We had to put the ribbons on the box and put the glasses in the box but did not take to long. We ordered shot glasses as wedding guest favors. I was surprised at how quickly I received them (about 2 weeks after the original order), and they were perfect. The favors were perfect! The size and font appeared even better than imagined. I ordered 50 wedding shot glass/votive favors along with the boxes for my Sons upcoming small wedding. I received them yesterday. All 50 came out exactly as i designed them. Zero broken in shipment & the see-thru boxes are nice too. I purchased these as wedding favors and they came out great! They shipped it with plenty of protection and the logo and wording was perfect! I can't wait to give these out at our wedding! The Shot glass / Votives were exactly what we had envisioned. The shot glasses were really nice & the favor boxes were good too. Thank you. Well done! I purchased these candle holders for my daughters sweet 16 and I cant believe how amazing they look. The shot glass/votives that I ordered actually arrived fully intact, much earlier than expected. They were beautiful. We received many complements on them. We could not be more pleased. The items came in great condition- no broken glass! The company is EXTREMELY helpful and accommodating! I had an unexpected increase in my guest list and needed rush delivery of 20 additional items. The usual time to ship is 3-4 weeks and I only had 10 days before the event. When I called, everyone was so nice and promised I would get the items on time. I got the items 8 days later! Just great service. Would buy again.